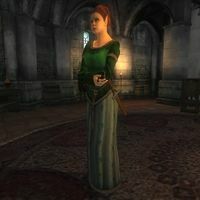 Atraena is an Altmer noble living at the Tiber Septim Hotel in the Imperial City's Talos Plaza District with her boyfriend, Faelian. Atraena wears a set of upper class clothing: a green brocade doublet with a green silk garment, a piece of leveled jewelry and a pair of blue suede shoes. She carries a iron dagger and a large sum of gold. Her entire life is spent in the hotel. Waking at 4am, Atraena heads into the hotel's study to eat breakfast for a rather indulgent five hours and then heads back to her room. Another six hours are spent here, simply pacing around the bed until 3pm and then she heads down to the hotel lobby. The hours between 3pm and 8pm are spent walking about the hotel lobby chatting to fellow guests and then it's time for bed again. When you get near her, it becomes apparent that she suffers quite a lot from Faelian’s drug abuse: "Oh, Faelian, dear Faelian... why must you ruin both our lives?" When you approach her, she will greet you in three different ways, depending on her disposition: "And what might you want... peasant? ", "Yes, good sir/my Lady? How may I help you?" Or "Ah, my dear friend. It is so good to see you." When asked about Faelian, she will admit her relationship with him, but will refuse to elaborate if her disposition is below 50: "Faelian? He... he's my sweet. My true love. But I don't know why I'm telling this to you. I mean, we hardly know each other and all... " When she likes you enough, she will tell you the full, tragic tale: "Please, I... I don't mean to get emotional but... I feel I can trust you. I just don't know what to do about Faelian! All he thinks about, all he cares about, is skooma! He was a fine young man once. But he's lost everything. His looks, his money... his self-respect. I followed him a few times, to see where he goes. He walks around the city looking for skooma, and then goes to Lorkmir's house for several hours. It's in the Elven Gardens District. I think the house is deserted. That's why he goes there. So he can escape from life and do his skooma! Thank you for listening. You're a good friend. I just hope my sweet Faelian can clean himself up, or that awful skooma will be the death of him!" After the conversation, she will act very strange: "Hmm? Oh, yes, goodbye..."
Atraena isn't enabled until stage 10 of the related quest, so cannot be found until then. Atraena is only supposed to spend five hours wandering around her room, but as there is no package defined between 2pm and 3pm, she keeps doing it for another hour.